During its huge Gamescom 2018 showcase in Cologne, Germany, Nvidia has revealed its brand new line of graphics cards, the GeForce RTX 20 Series. 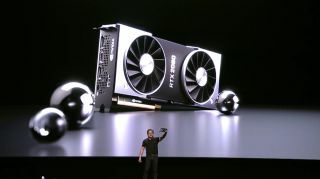 Three new Nvidia GeForce graphics cards appeared on Nvidia's own site complete with some amazing price tags just moments before CEO and founder Jen-sen Huang announced the new products on stage. Starting from the top, the GeForce RTX 2080 Ti is Nvidia's new flagship graphics card that promises to deliver 10 Giga Rays of ray tracing performance and 78 trillion RTX-OPS, a new performance metric that tracks the card's ray-tracing operations per second. Nvidia was light on specs, but we know it will feature 11GB of video RAM, most likely being GDDR6 as with the company's Quadro RTX cards. Just below that is the GeForce RTX 2080 equipped with 8GB of video RAM to deliver 8 Giga Rays and 60 trillion RTX-OPS. Lastly, the GeForce RTX 2070 8GB enables 6 Giga Rays and 60T RTX-OPS. However, while these prices were shown on stage during Nvidia's press conference, they do not match those found on the Nvidia website at the time of writing. Online, prices are still listed at $1,199 (AU$1,899) for the RTX 2080 Ti, $799 (AU$1,199) for the RTX 2080 proper and $599 (AU$899) for the RTX 2070 model. We're currently chalking this up to a bug, and expect to see Nvidia update its website shortly. That said, we recommend you don't pre-order until this change is made, as the purchase website will gladly take your money even if the price is wrong. All of Nvidia's new graphics cards will be available for pre-order starting today to arrive on September 20. Stay tuned for even more information and insights around the shiny, new RTX 20 Series.